Barn find is a term used when somebody finds a really special car which has been sitting in the corner of a barn all covered up. What the treasure hunter will do is restore the car to the way it came out of the factory. But restoration projects are not just limited to the barn finds for the real cars. 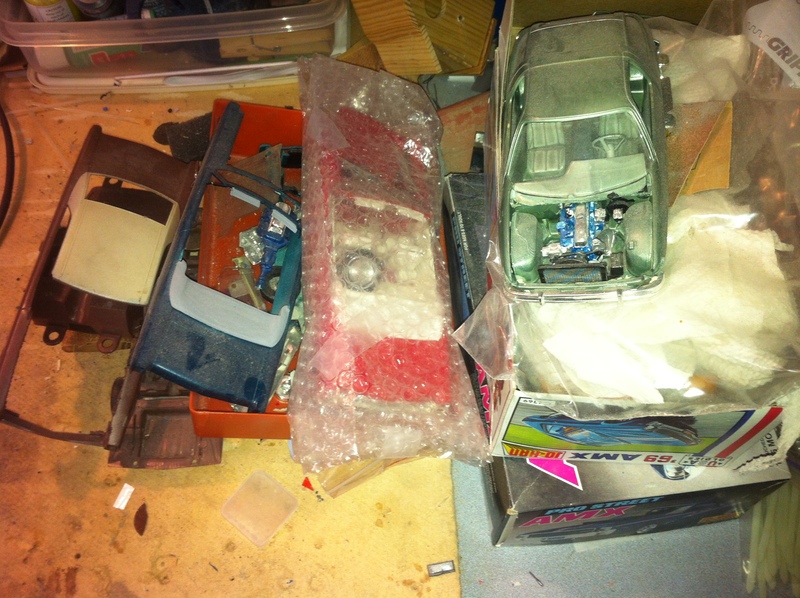 If you’re a collector like me, you will have a pile of promo model cars like this. The project on the left is a restoration of a 1968 Ambassador Convertible. The Pacer…eh…not sure what I’ll do with that. 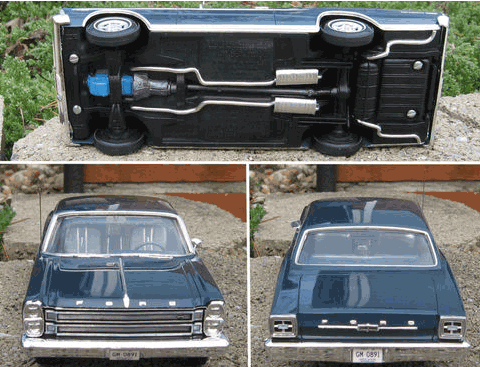 The other image (Courtesy Collector’s Weekly) is a ’66 Ford Galaxie 500 restored. More on that in a bit but first a bit of background on the real deal. The Ford Galaxie was the high volume counterpart to the Chevrolet Impala produced for model years 1959 through 1974 which is the same time this country had a real space program (sorry, had to put that in). Some Galaxies were high-performance, racing specification machines, a larger forebear to the muscle car era. Others were plain family sedans. This was certainly a high-volume car. 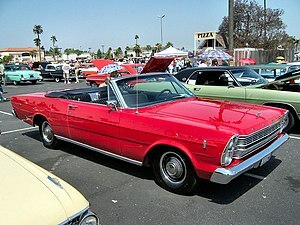 It was the second best selling Ford automobile platform after the Ford Model T.
The ’66 carried the new styling introduced the year before. It featured vertically stacked dual headlights in what was becoming the fashionable style in a car somewhat taller and bulkier than the previous year’s. 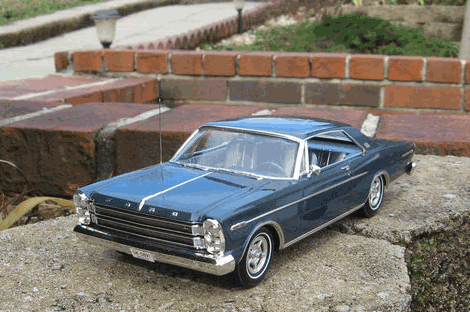 The new top-of-the-line designation this year was the Galaxie 500 LTD. There was a wide variety of engine choices Engine choices, an all-new 240 cu in (3.9 L) six-cylinder and 1965 289 cu in (4.7 L) engine replacing the ’50’s era 223 “Mileage-Maker” six and the 352 being equipped with dual exhausts and a four-barrel carburetor. That sounds fun! Ford, like Chevy and Chrysler were heavy into racing so the suspension was dramatically redesigned. Replacing the former leaf-spring rear suspension was a new three-link system, featuring all coils. Not only did the ride improve, but handling also got a boost, and this system was used for NASCAR in the full-size class. Not only a star in NASCAR, it was also a hit on TV and the Big Screen. During the brands run, a Galaxy appeared in CHiPs, I Spy, The Andy Griffith show, and Dennis the Menace among others and in the movies in Greased Lightning and Driving Miss Daisy. 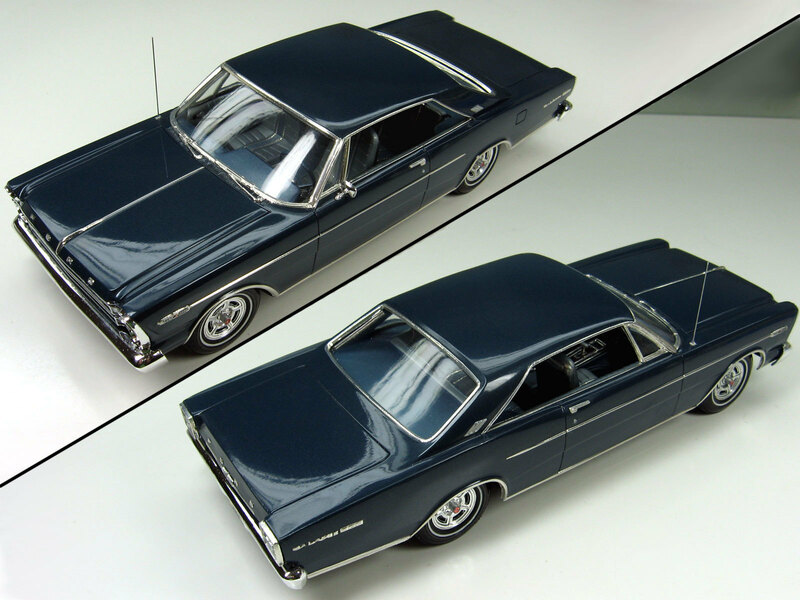 One of the sites I hang out at is Collector’s Weekly where they eBay lots of promo model cars like this one, a vintage 1966 Ford Galaxie 500 1/25 AMT promotional coaster, professionally restored and detailed. This guy did a great job too. It’s painted metallic Nightmist Blue and has been color sanded/polished to a beautiful shine. He also did a great job on the exterior details which include, chrome metal foil trim including all scripts and emblems, newly chromed bumpers/grille, a chrome steel fender mount antenna, rectangular side view mirror and period correct 1966 front and rear Michigan license plates. The interior looks sweet too detailed in three shades of blue with satin clear coats added. He then trimmed with vinyl wood grain dash, door panel and console inserts. Other interior additions include, more foil trim, rear view mirror, turn signal lever with console shifter and dark blue flocking for the carpeting. OK, now I’m getting really excited…easy boy…remember you’re saving up for that turbine for the jet that you bought. At the time I discovered it bidding was around $350 and whoever ends as the winning bidder will have a great model to add to his collection. OK, now I have to get back to my projects. Daddy needs cash.